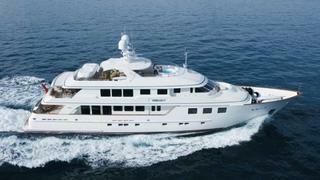 News from Moran Yacht & Ship of a $2 million price cut on the 44m motor yacht Maghreb V, centrally listed for sale. Built by Burger in 2006 in aluminium to ABS class and MCA compliant, Maghreb V was designed by the yard's in-house team. Formerly called Mirgab V, she features an elevator and wheelchair accessibility. Accommodation is for 14 guests in seven staterooms and 10 crew in five cabins and twin 2,735hp MTU engines give her a cruising speed of 13 knots. Comfort at sea and in port are assured by Quantum zero speed stabilisers. On display at the Fort Lauderdale International Boat Show, Maghreb V is down from $23,495,000 to $21,495,000.